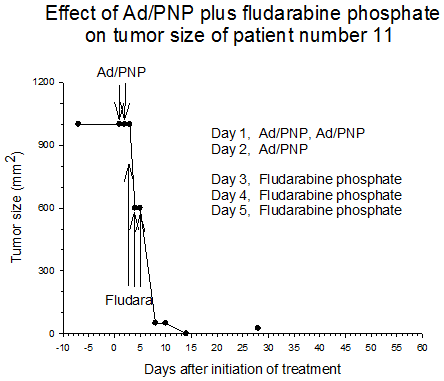 PNP Therapeutics has demonstrated that combining fludarabine phosphate (F-araAMP) and E. coli PNP results in exceptional anti-tumor activity in preclinical models. These results have been confirmed by many other research groups from around the world. 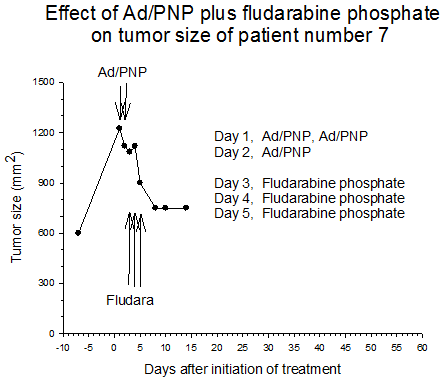 Based upon these preclinical results, we have initiated a phase I clinical trial at The University of Alabama at Birmingham (UAB), entitled “Phase I, open-label study evaluating the safety of escalating doses of PNP adenovirus injected intratumorally with co-administration of fludarabine in subjects with advanced solid tumors” (IND 14271, see reference below). 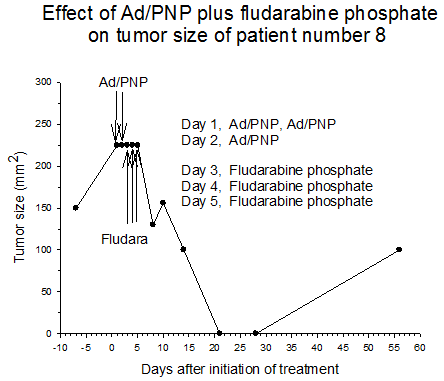 In this trial an adenoviral vector is used to deliver E. coli PNP (Ad/PNP) to head and neck tumors followed by systemic administration of F-araAMP. The clinical trial is designed in a conventional 3+3 format with escalating doses of F-araAMP in the first three cohorts and escalating virus in the fourth (Table 1). 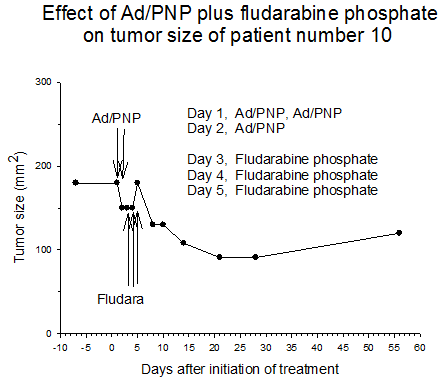 Five hundred μls (500 μl) of Ad/PNP was injected into the tumors twice on day 1 (separated by about 6 hours) and once on day 2 of the treatment. F-araAMP was administered IV three times in a manner similar to its use in the treatment of chronic lymphocytic leukemia (CLL); once daily over a 30 minute period on days 3, 4, and 5 of treatment. One cycle of F-araAMP therapy in the treatment of CLL is 25 mg/m2 (IV) once daily for 5 consecutive days. Therefore, up to 60% of the standard dose of F-araAMP was used in this trial. Rosenthal EL, Chung TK, Parker WB, Allan PW, Clemons L, Lowman D, Hong J, Hunt FR, Richman J, Conry RM, Mannion K, Carroll WR, Nabell L, Sorscher EJ (2015) Phase 1 dose-escalating trial of Escherichia coli purine nucleoside phosphorylase and fludarabine gene therapy for advanced solid tumors. Annals of Oncology 26: 1481-1487. Summary of toxicity data. To date, eleven patients have successfully completed therapy without serious adverse events attributable to the treatment. There were no grade 3/4 toxicities associated with the therapeutic intervention. The most common event related to treatment was pain/itching/redness associated with injection site and flu-like symptoms in the immediate several days following viral injection. Summary of efficacy data. Clinical monitoring of the tumors was performed which demonstrated stable disease in the majority of treated tumors (five of six masses) from cohorts 1 and 2 in which the patients received low doses of F-araAMP. A strong anti-tumor response has been observed in the 5 patients from cohorts 3 and 4 studied to date, including subjects receiving the highest dose of F-araAMP. 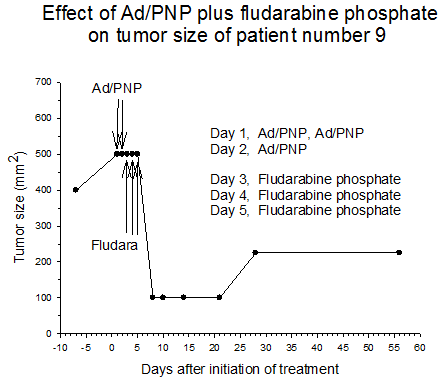 These results indicate that generation of F-Ade in tumor tissues using E. coli PNP and F-araAMP is both safe and effective. The pronounced effect on tumor volume after a single treatment cycle suggests that repeat administration of the therapy could be very useful against large tumor masses, and with less morbidity than typically associated with surgery or radiation.